President Trump on Monday signed a major disaster declaration for the areas affected by the ongoing wildfires in California, following through on a request made over the weekend by California Gov. Jerry Brown (D). The declaration orders an increase in federal aid to supplement state, local and tribal areas in Butte, Los Angeles, and Ventura counties. 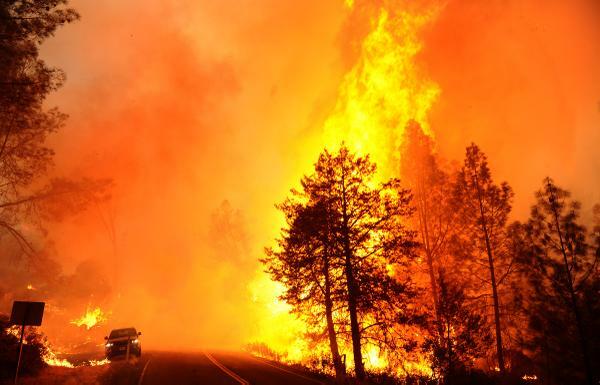 The wildfire has killed 43 people, with nearly 230 people missing in Northern California. Officials say the fires are the most destructive in the state’s history. Can someone explain? As I was watching some clips of the CA fire and looking at pictures that were taken during the fire, there were houses that burned to the ground while trees surrounding it are still green. A van that’s officially burned with windows shot out while the houses and trees surrounding it are untouched. Other houses and businesses burned while trees surrounding it are untouched and still green.